July | 2014 | We've Got Some Issues. Central Conflict: The X-Men VS. The Avengers & Professor Xavier VS. Lucifer. The last crossover between The X-Men and another pre-existing Marvel character from another book happened three issues ago when our mutants ran into and (battled to a standstill) Namor the Sub-Mariner. In Issue 9, it happens again; there’s a pattern brewing here. The action starts right out of the gate. We join the X-Men in their civilian/nerd/prep garb. The team is hanging about a luxury ocean-liner bound for Europe through iceberg-studded seas. Cyclops breaks with his normal, nothing-to-see-here, dorky persona and shoots apart a mountain of ice blocking the ship’s path with an optic blast. This, presumably, saves the lives of all aboard but puts the real fear into the team. 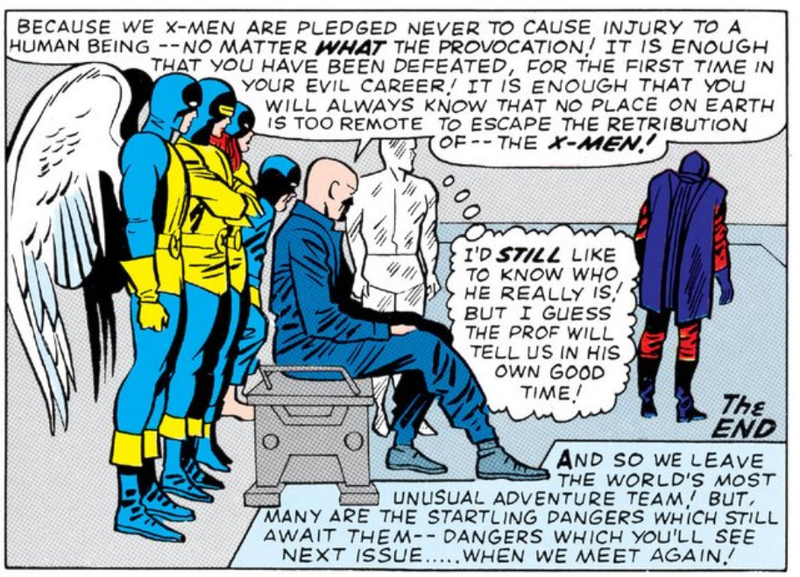 Nervous that they’ve just made themselves conspicuous (which they have), they retire to their cabins where Cyclops is struck by a psychic communique from Professor Xavier (last seen spelunking in the Balkans in a wheelchair DARPA could have designed). Xavier states in his typically exclamatory way that his mysterious European journey is reaching its conclusion. All this time, he’s been in pursuit of a villain named Lucifer. 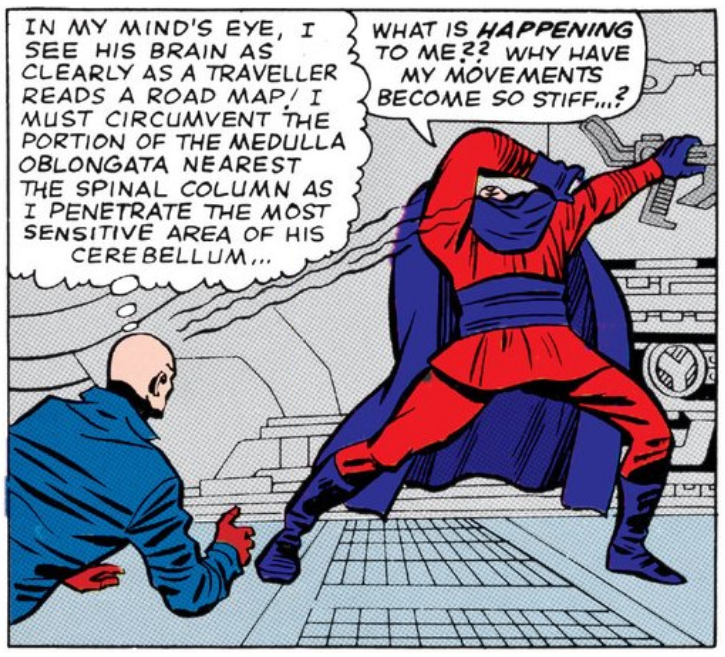 (Jack Kirby: Hey, Stan, what should we call this villain? Stan Lee: What are his powers? Stan: Does he have a motive? Trundling through the tunnels on his jacked-up sled, Xavier faces a handful of Lucifer’s Mousetrap-like challenges including an “artificial dust devil” (get it?). 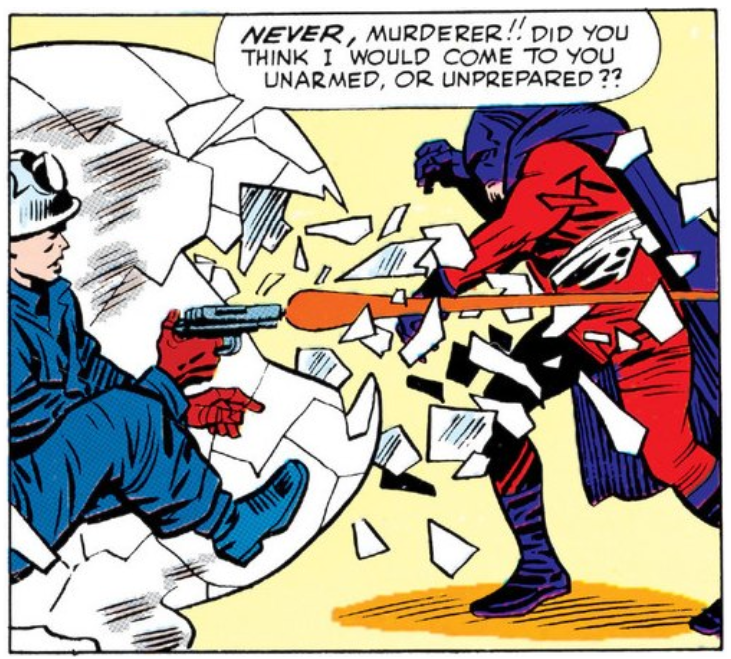 Xavier gets out of all this with some go-go-gadget tricks and then, disappointingly, a pistol. 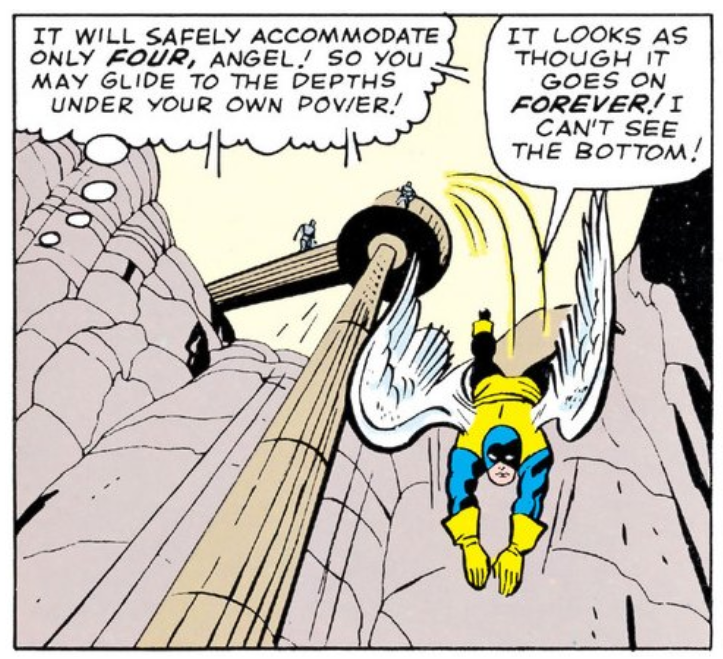 Elsewhere, Xavier is still struggling against Lucifer, who, in monologue, explains his plot: he has wired a “giant thermal bomb” to his own heartbeat. If he should die, the bomb detonates. 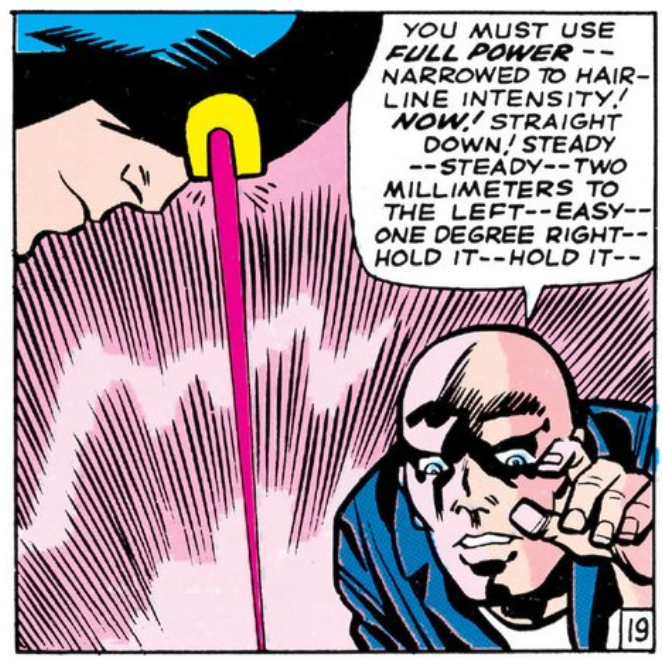 But in the meantime, he’s also prepared an attack against The X-men themselves (a super-charged ionic ray). So. While the bombs and rays and charges are piling up into a robust and overstuffed word salad, Xavier (why not?) projects a mental ghost of himself out into the world to warn his team. The X-Men, however, are occupied. They’ve run straight into The Avengers and, as per the indisputable and codified law of superhero encounters, they must commence with the fisticuffs. 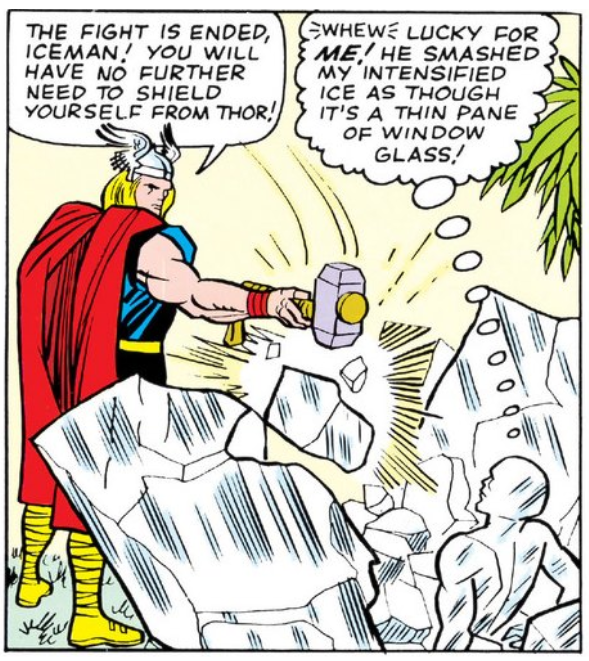 Thor, persuaded by the vibrations of his hammer, believes that whatever evil is nearby is so powerful it must be obliterated outright. (By the way, why are the Avengers going along with this? Nobody ever questions the hammer?) 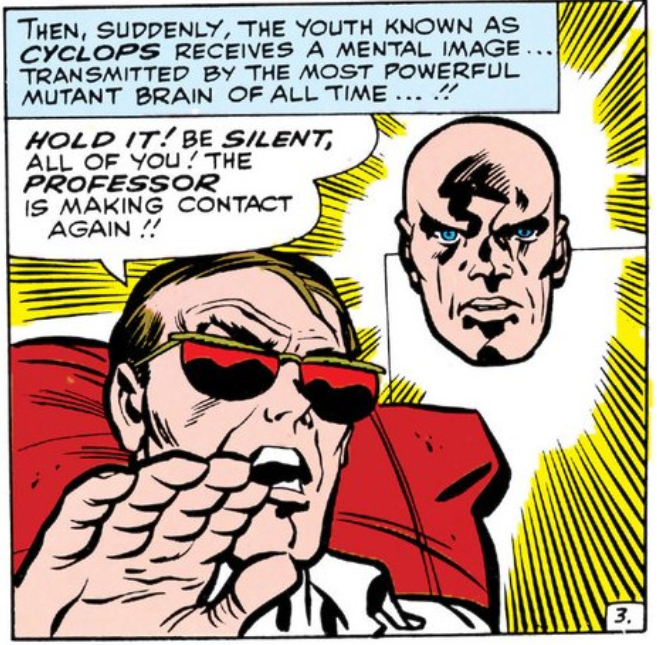 Warned by Xavier’s telepathic projection, Cyclops knows that Lucifer cannot be destroyed by the Avengers without igniting the bomb (which neither The X-Men or Avengers have seen). The battle itself is pretty lively. Rather than a power-for-power face-off, the action sprawls all over the place. 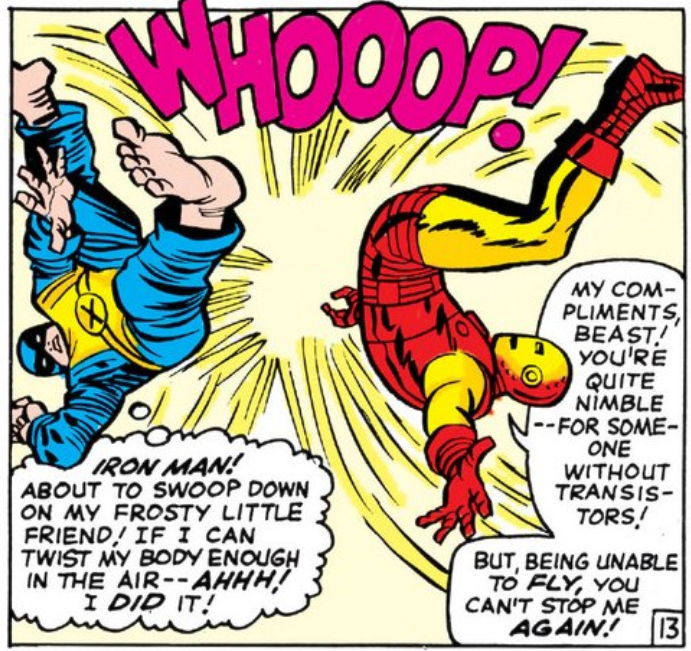 Beast, for instance, finds himself tangling with Captain American, Giant-Man and Iron-Man all in a swift tear of panels. Underground and without support, Xavier does his best to take on Lucifer directly. Doing what he should have done in the first place, the Professor sends a mental hunter-seeker (Dune reference, ladies!) swimming through Lucifer’s brain to knock him out without affecting his heartbeat. Xavier reaches out to the Avengers and basically tells them to cool it. 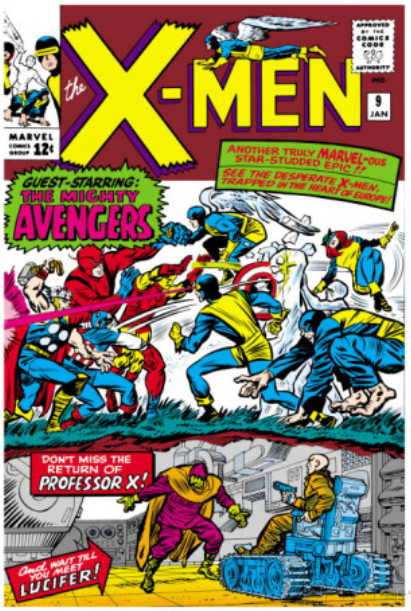 After hearing the telepathic sitrep from Xavier (a mutant they have never met), the Avengers buy it and decide to abandon their fight against the X-Men, wishing them well, and heading out to enjoy Bavaria or whatever. Now freed up, the X-Men go spelunking themselves to find their leader and defuse his opponent’s thermal bomb. Cyclops and Xavier get to work defeating the doomsday device with a combination of their physical and mental powers. 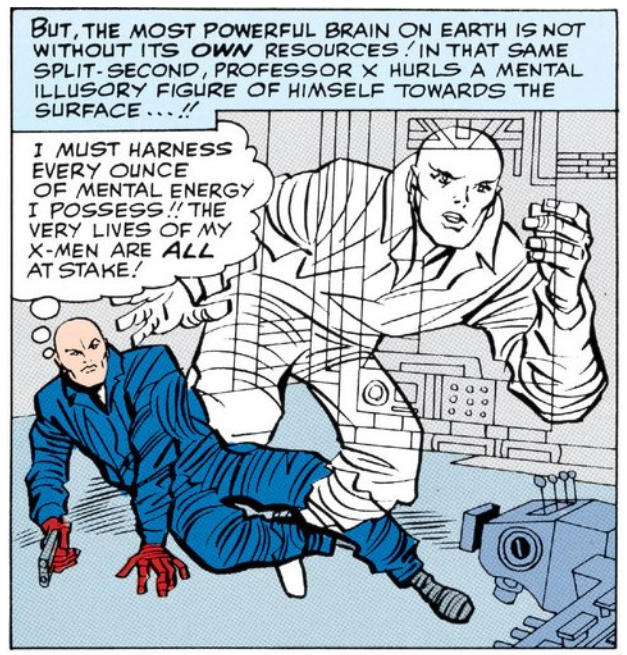 The telepathic/optic blast surgery gets intense, as indicated by Xavier’s maniacal, “It’s alive! It’s alive!” expression. So, yeah, the bomb gets defused. But that’s about it. 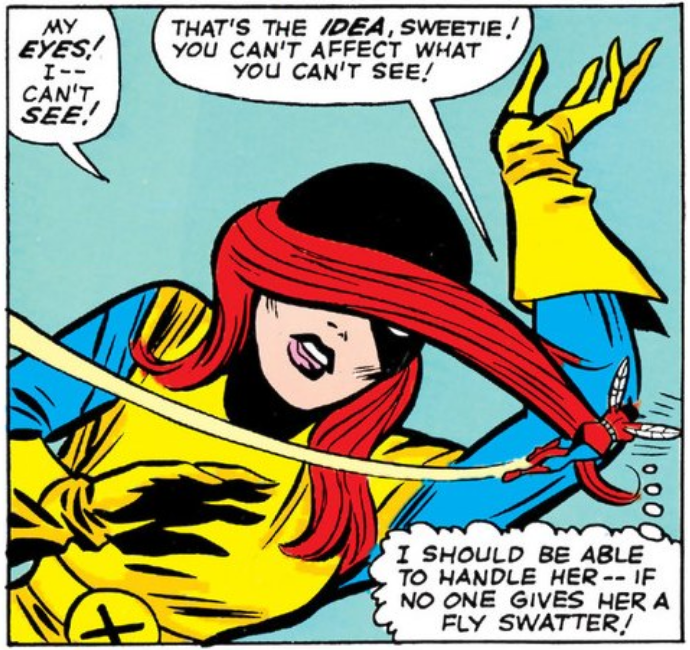 The X-Men and the reader get no real explanation and not much satisfaction from the issue aside from watching the X-Men and the Avengers dance for the first time. But that complaint aside, at nine issues deep, the X-Men books are well on their way toward establishing an impressive and nuanced reality. Case in point: their leader is dynamic. Xavier comes and goes as he pleases. He withholds secrets, has a mysterious past, and privately lusts after one of his students. Xavier may be the breakout character thus far. Unlike, say, other leaders of action squads, he is neither a disembodied voice warbling from a mysterious screen, nor is he a cheerful and vacant do-gooder hell-bent on merely saving the day. His is a darker shade, packed with complexities yet to be revealed. After this issue it also seems like The X-Men themselves are doing a pretty bang-up job of proving themselves worthy of the title (and the books that bears their title): they scrap and survive, but more importantly, they display real depth and character. In their time so far, some of them have quit and come back, they’ve doubted, they’ve raged, they’ve crushed on one another and more. Has it been perfect? Not at all. But who wants perfect superheroes?